Welcome to 12 Reef Rd Cape Elizabeth, truly one of the areas finest oceanview rental properties. Offering 4 bedrooms and 3 baths the property is a wonderful mix of coastal charm and contemporary details set on an elevated lot enhancing the breathtaking views of the Atlantic Ocean. The luxury oceanview home located in the Shore Acres neighborhood is steps to a neighborhood beach. If you prefer a pool simply walk out your back door to enjoy a private pool and deck with plenty of seating. Yard is well landscaped for privacy and offers a great space for all to play. The home has been completely renovated and is available to rent for the first time ever beginning Summer 2019. Two levels of living offer comfortable accommodations for up to 8. Strict occupancy rules apply. An ideal, open-concept, first floor is streaming with light and walls of windows across the kitchen, dining area, and living room. Walking into the home you are greeted by a thoughtfully laid out open concept living room with quality contemporary furnishings, flat panel TV and plenty of seating to enjoy the view. 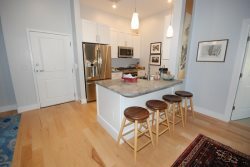 Kitchen has been professionally designed and offers a wonderful layout, custom cabinets, stainless appliances, and a lovely pantry. Dining area offers seating for 6. Additionally the main level offers a full bathroom, laundry room with full size washer and dryer along with 2 nicely sized guest bedrooms each offering a queen bed. Up the stairs one is greeted by a wide hallway offering a seating area perfect for curling up with a good book. An impressively designed master suite offers cathedral ceiling, king bed, a sitting area, large glass slider leading to private deck, a large walk in closet. A luxurious master bathroom finishes off the space with a custom tile shower with glass enclosure, a clawfoot tub, and 2 vanities. An additional bedroom on the second level offers a full sized bed. Minutes to the areas best shopping and restaurants in charming Cape Elizabeth...Be sure to check out The Lobster Shack at Two Lights, Bird Dog Roadhouse, and The Good Table. C Salt Gourmet Market offers gourmet foods, as well as many sandwich options. Just 15 minutes to Portland and the Jetport.